I have to admit... Reebok treadmills are not cheap. Their prices are a little too expensive compared to similar entry level treadmills from other brands. But they have something others don't... a brand that people trust and are familiar with. Like most known brands, Reebok exercise equipment are also being created by the largest manufacturer and marketer of exercise equipment in the world, which is Icon Health and Fitness. Icon holds hundreds of patents and patent applications pending. Reebok also holds several trademarks both in the United States and in other foreign countries. They have invested millions in developing state-of-the-art production, research and development, distribution and reporting systems to quickly design and engineer new product enhancements. These treadmills were "designed for clubs, made for the home". But don't be confused by commercial treadmills carrying the Reebok brand. Only those treadmills made for home use came from Icon. Reebok treadmills for club comes from a different manufacturer. The biggest reason why people choose to buy this company's treadmills is the name. It's only logical to buy from someone that you trust. Plus, you can be sure that the company would be here to stay if ever you'll need their services years from now. Ofcourse, as with almost all well-known brands come overpriced products. Reebok's machines are no exemption. They are priced between $1,000 to $1,300, which is higher compared to similar entry level models offered by other companies. Another thing to take note is that Treadmill doctor, an expert in treadmill assessment, states that "there are some serious compromises in component construction" of the company's treadmills. However, if you're a loyal Reebok customer who just so happened to also have the money to spend, then who am I to stop you. The company does have a good brand reputation, that's something I can't argue with. Where To Buy Reebok Treadmills? If even after reading my recommendation you still would want to purchase a treadmill from Reebok, then Reebok store on amazon is one internet retailer I recommend. But before you buy, you may want to read our reviews on individual Reebok products below to help you find the one that suits you best. 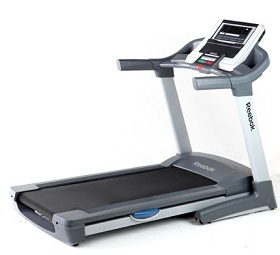 Others: This entry level Reebok is suprisingly better than your average $800 treadmill. Others: This would have been an excellent treadmill if not for the small motor. Others: One of the best Reeboks out there right now. If you really want a Reebok, this is the treadmill to buy. Below are some of the older treadmills from Reebok that have been discontinued. I won't be deleting these reviews for now since most of these treadmills are still being sold online through auction sites or as used machines. Others: This treadmill was cheaper and packed with better specs and features than most of the Reebok’s previous models. Others: This machine offered the biggest motor of all Reebok treadmills during its introduction. Others: Released just a few years ago, this model was, according to Reebok, their strongest treadmill during that time. Others: Nice packaging but the quality is below average. Ever Used a Reebok Treadmill? If you're using or have used a Reebok, chances are visitors of this site would love to hear from you. Write about your experience! It's fun, free and easy to do. Owner - Reebok Rx9200 - Model RBTL22920. Solid treadmill. No complaints. I workout 6 days/week for 5 years still runs great.